3GPP has defined several options for stand-alone and non-stand-alone network topologies. Some involve using existing infrastructure while others focus on entirely new topologies for moving control and data signals. 5G continues to move forward, but will 2018 be the year we remember as the year 5G became a reality? Let’s take a look at what’s happened and what we can expect. With the first draft of the initial 5G specification, Release 15, released in December 2017, the 3GPP and its contributors continue to evolve the standard toward achieving the lofty goals initially set in 2015. Release 15 focused on the non-standalone (NSA) modes and specifically the Option 3 configurations. In June, the 3GPP finalized the first standalone (SA) topology utilizing a new next generation core network (NGC). Although different, the SA and NSA topologies provide service operators with several options for 5G network deployment. NSA relies on the existing evolved packet core (EPC) or LTE network infrastructure to cost effectively transition to 5G services in a shorter timeframe. The alternative SA model requires network operators to replace the core network infrastructure, which takes time to deploy. While SA unlocks more 5G features, it does require service operators to replace, purchase, and deploy costly equipment. NSA utilizes LTE random access network (RAN) to establish communication and send control information to the 5G gNodeB. There are three specific NSA Option 3 configurations: Option 3, Option 3a, and Option 3x. Figure 1 shows how data (solid lines) and control (dashed lines) connect among EPC, LTE eNodeB, and 5G gNodeB in the three flavors of Option 3. 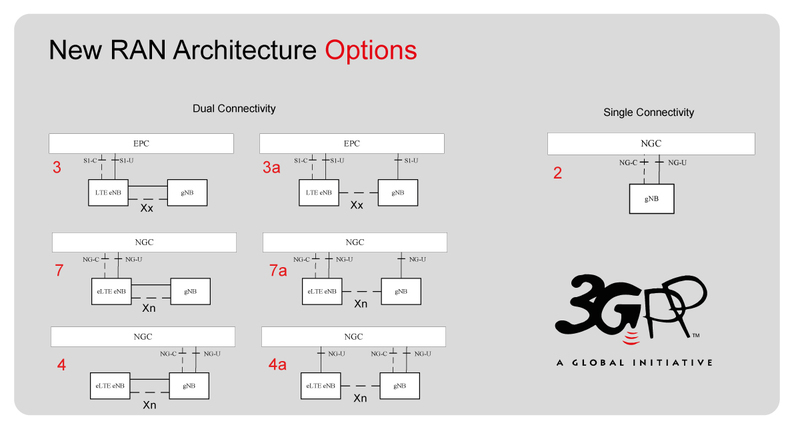 As of this writing, 3GPP has defined Option 3x but has not incorporated the Option 3x diagram into its new RAN architecture options diagram. Option 3x is shaping up to be the most popular flavor of Option 3. Figure 1. 5G non-standalone has several options for sending control and data signals. Source: 3GPP with modifications to add Option 3x. SA mode utilizes a new core network or NGC in a single connectivity topology to deliver a “true” 5G experience where the control and user planes are built on a new RAN. SA mode, Option 2 was finalized in June 2018 and the industry has already begun architecture developments toward productization and commercialization. In December 2018, the 3GPP will complete NSA by defining two additional configurations – Option 4 and Option 7. These configurations take advantage of NGC but enable connectivity for existing LTE eNodeBs (ie legacy equipment). These configurations ensure that LTE may indeed have a longer life than prior standards and may be complementary to the 5G capabilities delivered in Release 15. The 3GPP continues to evolve LTE with goals of enhancing IoT capabilities along with V2X. Currently, infrastructure vendors around the world are conducting field trials with new 5G equipment and they're measuring the results. The operators conduct these trials to test interoperability of equipment, evaluate the performance of the various options, and gather vital data necessary for network planning. These initial trials are focused on NSA modes including sub 6 GHz and mmWave equipment. Early indications reveal a focus on sub 6 GHz, NSA deployments (Option 3/3a/3x), and a migration to mmWave in 2019. SA will soon follow but it's too early to predict when exactly that will happen. 5G continues to garner a fair share of visibility and the “roll your sleeves up” work is well underway and on track to deliver state-of-the-art solutions as early as 2019. Much of the work done in 2018 is critical to deploying a new network with unprecedented capabilities. 5G is close, but we just might have to wait a little longer. —James Kimery is the director of marketing for RF, communications, and software defined radio (SDR) initiatives at National Instruments.